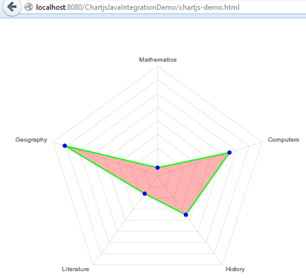 "Chart JS Library" provides API for drawing different charts. Drawing is based on HTML CANVAS Element. 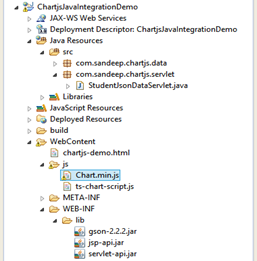 In this Demo, "We will draw a Radar Chart .The Student input data is JSON in nature.The Servlet returns the JSON data when called by Jquery Ajax method.The Student Java class object is converted to JSON representation using GSON Library".